This conversation between Jehovah God and Jonah is without a doubt an expression of the Creator’s true feelings for humanity. On one hand it informs people of the Creator’s understanding of all creation under His command; as Jehovah God said, “And should not I spare Nineveh, that great city, wherein are more then six score thousand persons that cannot discern between their right hand and their left hand; and also much cattle?” In other words, God’s understanding of Nineveh was far from a cursory one. He not only knew the number of living things within the city (including people and livestock), He also knew how many could not discern between their right and left hands—that is, how many children and youths were present. This is concrete proof of God’s superb understanding of mankind. On the other hand this conversation informs people of the Creator’s attitude toward humanity, which is to say the weight of humanity in the Creator’s heart. It is just as Jehovah God said: “You have had pity on the gourd, for the which you have not labored, neither made it grow; which came up in a night, and perished in a night: And should not I spare Nineveh, that great city…?” These are Jehovah God’s words of blame toward Jonah, but they are all true. Although Jonah was entrusted with proclaiming Jehovah God’s words to the people of Nineveh, he did not understand Jehovah God’s intentions, nor did he understand His worries and expectations for the people of the city. With this reprimand God meant to tell him that humanity was the product of His own hands, and God had put forth painstaking effort for every single person; every person carried with them God’s hopes; every person enjoyed the supply of God’s life; for every person, God had paid a painstaking cost. This reprimand also told Jonah that God cherished humanity, the work of His own hands, as much as Jonah himself cherished the gourd. God would by no means easily abandon them before the last possible moment; moreover, there were so many children and innocent livestock inside the city. When dealing with these young and ignorant products of God’s creation, who could not even distinguish their right hands from their left, God was all the more unable to end their lives and determine their outcomes in such a hasty manner. 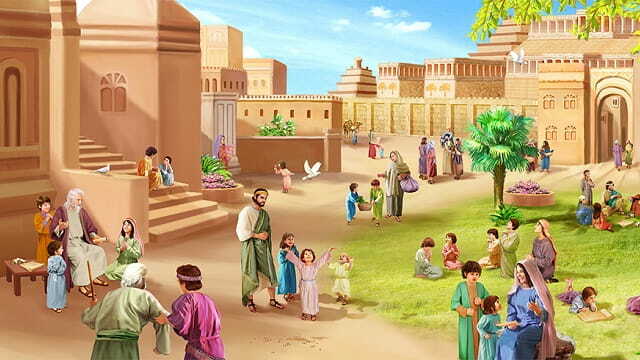 God hoped to see them grow up; He hoped that they would not walk the same paths as their elders, that they would not have to hear Jehovah God’s warning again, and that they would bear witness to Nineveh’s past. Even more so God hoped to see Nineveh after it had repented, to see Nineveh’s future following its repentance, and more importantly, to see Nineveh live under God’s mercy once again. Therefore, in God’s eyes, those objects of creation who could not distinguish between their right and left hands were Nineveh’s future. They would shoulder Nineveh’s despicable past, just as they would shoulder the important duty of bearing witness to Nineveh’s past and future under Jehovah God’s guidance. In this declaration of His true feelings, Jehovah God presented the Creator’s mercy for humanity in its entirety. It showed to humanity that “the Creator’s mercy” is not an empty phrase, nor is it a hollow promise; it has concrete principles, methods and objectives. He is true and real, and uses no falsehoods or disguises, and in this same manner His mercy is endlessly bestowed upon humanity in every time and age. However, to this very day, the Creator’s exchange with Jonah is God’s sole, exclusive verbal statement of why He shows mercy to humanity, how He shows mercy to humanity, how tolerant He is of humanity and His true feelings for humanity. Jehovah God’s succinct conversation expresses His complete thoughts for humanity; it is a true expression of His heart’s attitude toward humanity, and it is also concrete proof of His bestowal of abundant mercy upon humanity. His mercy is not only bestowed upon humanity’s elder generations; it is also granted to the younger members of humanity, just as it has always been, from one generation to the next. Although God’s wrath frequently comes down upon certain corners and certain eras of humanity, God’s mercy has never ceased. With His mercy, He guides and leads one generation of His creation after the next, supplies and nourishes one generation of creation after the next, because His true feelings toward humanity will never change. Just as Jehovah God said: “And should I not spare Nineveh…?” He has always cherished His own creation. This is the mercy of the Creator’s righteous disposition, and it is also the pure uniqueness of the Creator! When the people of Sodom saw these two servants, they did not ask their reason for coming, nor did anyone ask whether they had come to spread God’s will. To the contrary, they formed a mob and, without waiting for an explanation, came to seize these two servants like wild dogs or vicious wolves. Did God watch these things as they happened? What was God thinking in His heart as to this kind of human behavior, this kind of thing? God decided to destroy this city; He would not hesitate or wait, nor would He continue to show patience. His day had come, and so He set about the work He wished to do. Thus, Genesis 19:24-25 says, “Then the LORD rained on Sodom and on Gomorrah brimstone and fire from the LORD out of heaven; And he overthrew those cities, and all the plain, and all the inhabitants of the cities, and that which grew on the ground.” These two verses tell people the method with which God destroyed this city; it also tells people what God destroyed. First, the Bible recounts that God burned the city with fire, and that the extent of the fire was enough to destroy all the people and that which grew on the ground. That is to say, the fire that fell from heaven not only destroyed the city; it also destroyed all people and living things inside it, all without leaving a single trace behind. After the city was destroyed, the land was bare of living things. There was no more life, nor any signs of it. The city had become a wasteland, an empty place filled with dead silence. There would be no more evil deeds against God in this place; there would be no more slaughter or spilled blood. Why did God want to burn this city so thoroughly? What can you see here? Would God bear to watch mankind and nature, His own creations, be destroyed like this? If you can discern Jehovah God’s anger from the fire that was cast down from heaven, then it is not difficult to see the level of His rage from the target of His destruction as well as from the degree to which this city was destroyed. When God despises a city, He will render His punishment upon it. When God is disgusted with a city, He will issue repeated warnings informing people of His anger. However, when God decides to put an end to and destroy a city—that is, when His wrath and majesty have been offended—He will deliver no further punishments or warnings. Instead, He will directly destroy it. He will make it utterly disappear. This is God’s righteous disposition. from God Himself, the Unique II Peace be with you all! Dear brothers and sisters, if you have any understanding or enlightenment from God, you’re welcome to share with us.1. Via the online chat window at the bottom right corner of the screen.2. Send an email to info@testifygod.org.We sincerely hope we’ll grow spiritually through sharing with each other. On that night, Lot received two messengers from God and prepared a feast for them. After dining, before they had lain down, people from all over the city surrounded Lot’s residence and called out to Lot. The Scripture records them as saying, “Where are the men which came in to you this night? bring them out to us, that we may know them.” Who said these words? To whom were they spoken? These were the words of the people of Sodom, yelled outside Lot’s residence and meant for Lot. How does it feel to hear these words? Are you furious? Do these words sicken you? Are you simmering with rage? Do these words not reek of Satan? Through them, can you sense the evil and darkness in this city? Can you sense the cruelty and barbarity of these people’s behavior through their words? Can you sense the depth of their corruption through their behavior? Through the content of their speech, it is not difficult to see that their iniquitous nature and savage disposition had reached a level beyond their own control. Save for Lot, every last person in this city was no different from Satan; the mere sight of another person made these people want to harm and devour them…. These things not only give one a sense of the city’s ghastly and terrifying nature, as well as the aura of death around it; they also give one a sense of its iniquity and bloodiness. As he found himself face-to-face with a gang of inhumane thugs, people who were filled with soul-devouring ambition, how did Lot respond? According to the Scripture: “I pray you … do not so wickedly. Behold now, I have two daughters which have not known man; let me, I pray you, bring them out to you, and do you to them as is good in your eyes: only to these men do nothing; for therefore came they under the shadow of my roof.” Lot meant the following with his words: He was willing to give up his two daughters in order to protect the messengers. Out of reason, these people should have agreed to Lot’s conditions and left the two messengers alone; after all, the messengers were perfect strangers to them, people who had absolutely nothing to do with them; these two messengers had never harmed their interests. However, motivated by their iniquitous nature, they did not leave the matter at this. Rather, they only intensified their efforts. Here another one of their exchanges can undoubtedly give one further insight into these people’s true vicious nature; at the same time it also lets one know and comprehend the reason why God wished to destroy this city. So what did they say next? As the Bible reads: “Stand back. And they said again, This one fellow came in to sojourn, and he will needs be a judge: now will we deal worse with you, than with them. And they pressed sore on the man, even Lot, and came near to break the door.” Why did they want to break down the door? The reason is that they were only too anxious to harm those two messengers. What were those messengers doing in Sodom? Their purpose in coming there was to save Lot and his family; however, the people of the city mistakenly thought that they had come to assume official posts. Without asking their purpose, it was merely conjecture that made the city want to savagely harm these two messengers; they wished to harm two people who had nothing whatsoever to do with them. It is clear that the people of this city had utterly lost their humanity and reason. The degree of their insanity and wildness was already no different from Satan’s vicious nature of harming and devouring men. When they demanded these people from Lot, what did Lot do? From the text we know that Lot did not hand them over. Did Lot know these two messengers of God? Of course not! But why was he able to save these two people? Did he know what they had come to do? Although he was unaware of their reason for coming, he did know that they were God’s servants, and so he received them. That he could call these servants of God lords shows that Lot was usually a follower of God, unlike the others inside Sodom. Therefore, when God’s messengers came to him, he risked his own life to receive these two servants; furthermore, he also exchanged his two daughters in order to protect these two servants. This is Lot’s righteous deed; it is also a tangible expression of Lot’s nature and substance, and it is also the reason God sent His servants to save Lot. When faced with peril, Lot protected these two servants without regard for anything else; he even attempted to trade his two daughters in exchange for the servants’ safety. Other than Lot, was there anyone else inside the city who could have done something like this? As the facts prove—no! Therefore, it goes without saying that everyone inside Sodom, save for Lot, was a target for destruction as well as a target that deserved destruction. from God Himself, the Unique II Peace be with you all! Dear brothers and sisters, if you have any understanding or enlightenment from God, you’re welcome to share with us.1. Via the online chat window at the bottom right corner of the screen.2. Send an email to info@testifygod.org.We sincerely hope we’ll grow spiritually through sharing with each other.